If you live outside of the City of Midland and are in need of a ride within Midland County, the County Connection is available. 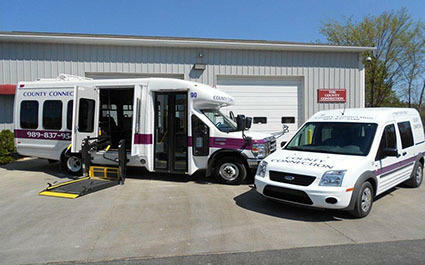 County Connection is a demand/response transit system operated for and supervised by the County of Midland. Services are county-wide, and available to all residents of Midland County except those within the city of Midland, depending on destination. 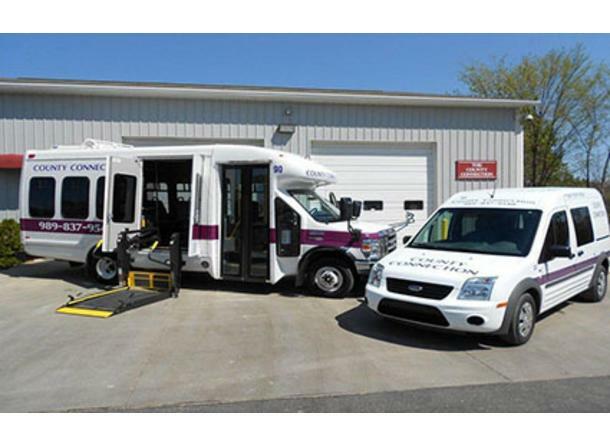 County Connection provides curb-to-curb transportation services for Midland County residents to and from work, school, medical appointments and shopping. Saturday: 5:30a.m. - 9:30a.m. & 2:30p.m. - 7:30p.m. Note: A no-show will be charged when a scheduled ride is not taken and not canceled at least one hour prior to pick-up. No-show charges will be paid with next ride fare. No exceptions. 1) Call before 5:00 pm at least one day prior to your pick-up. 2) Call before 5:00 pm on Friday for Saturday or Monday rides. 3) Set up both pick-up and return rides at the same time. 5) Pick-up times can be within 15 minutes before or after scheduled time. 6) Wait time is 3 minutes so be ready! For more information on the County Connection (such as guidelines and policies) or to schedule a ride, please call the number listed above or visit our website.